Looking for a keto salad recipe that’s better than the average salad? 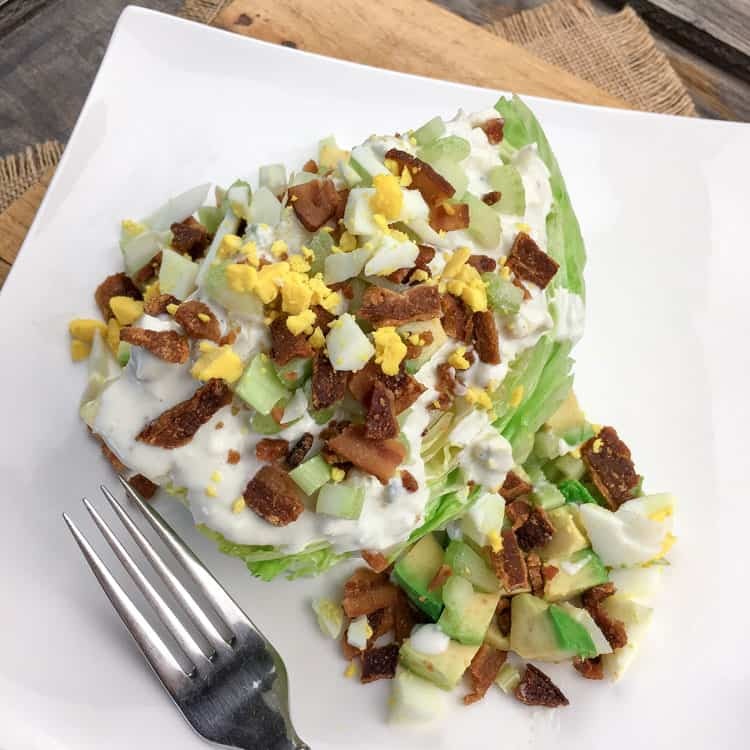 Try this delicious Wedge Salad with Homemade Blue Cheese Dressing! One of the best things about the keto diet (a “high fat, low carb” diet) is you get to load up on high-fat foods that are typically shunned in diets. Most diets will have you eating a paltry salad with little to no dressing that leaves you unfulfilled and hating salad. Doesn’t that sound like such a decadent salad dressing? With a salad dressing like that, you’ll never feel like you’re on a diet. This salad is exploding with flavor and definitely won’t kick you out of ketosis. 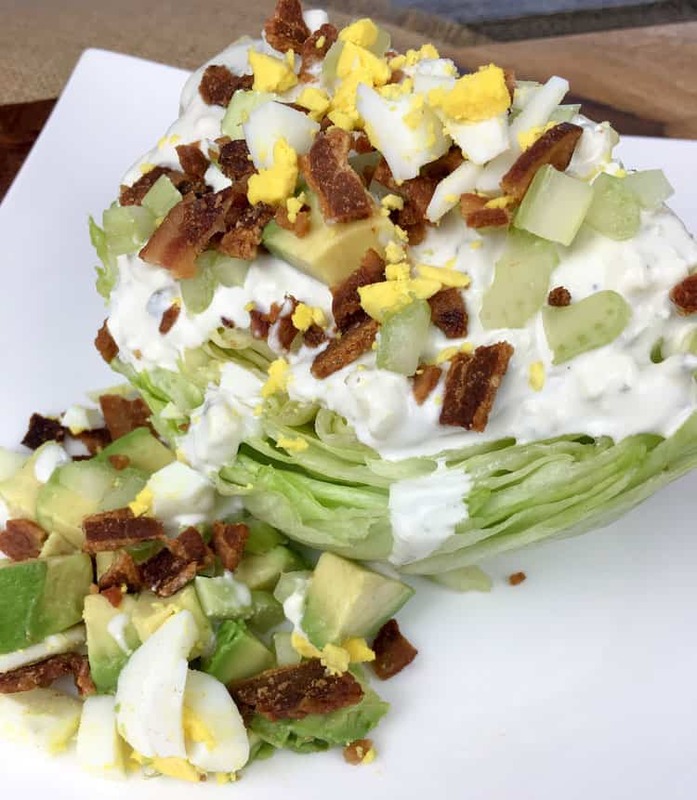 Mayonnaise, cheese, yogurt, sour cream, avocados, bacon, eggs… yum! It’s loaded with tons of fat and few carbs. This keto salad is hearty enough to be served as a light main course, or you can pair it with another keto friendly entree such as Keto Chicken with Garlic and Herbs. First, start by making the salad dressing. It’s best to prepare the keto dressing the night before so the flavors have a chance to blend thoroughly. Make the salad dressing by combining the avocado mayonnaise, blue cheese, Greek yogurt, sour cream, and garlic salt in a medium bowl. If it’s not at your desired consistency, you can add heavy cream until it’s where you’d like it to be. Season with salt and pepper to taste, and stir to combine. Store in the fridge until you need it. Next, prepare the salad. Place each iceberg lettuce wedge onto individual chilled plates. Drizzle dressing onto each wedge. Top with an equal amount of avocado, bacon, chopped hard-boiled eggs, and chopped celery. Season with salt and pepper to taste and serve immediately. How Many Servings are in This Keto Salad? You’ll cut the head of lettuce into six wedges, which means there are six servings in this recipe. However, there are so few grams of carbs in each serving that there is no harm in eating more than one wedge! How Many Carbs are in This Keto Salad? This easy keto recipe is super low in carbs! Each serving contains only 5.2 grams of carbs… 3.2 grams of which is fiber. That gives each serving a net carb count of only 2 grams. Yep, only 2 grams! Interested in Keto Salad Dressing Ideas? While this keto salad comes with its own decadent salad dressing, what about those times when you want a keto-friendly salad dressing but aren’t sure what to have? Check out my Broccoli Keto Slaw post in the “Keto Salad Dressing” section for more keto dressing ideas. This Keto Wedge Salad recipe is loaded with flavor! To create the keto dressing: Combine avocado mayonnaise, blue cheese, Greek yogurt, sour cream, and garlic salt in a medium bowl (glass or other non-reactive bowl). If not at your desired consistency, stir in heavy cream to reach your ideal dressing. Season with salt and pepper to taste. Stir to combine. Cover and then place in fridge until you’re ready to use it. To serve: Place each iceberg lettuce wedge onto individual chilled plates. Drizzle dressing onto each wedge. Top with an equal amount of avocado, bacon, chopped hard-boiled eggs, and chopped celery. Season with salt and pepper to taste. Serve immediately. I always forget about simple wedge salads, I’m adding it to my list. Yum, I bet the dressing is delicious. Just a note: Half and half isn’t allowed on most keto diets. It’s heavy cream all the way! Thank you! I’ve updated the recipe to heavy cream so it fits with a strict keto diet.